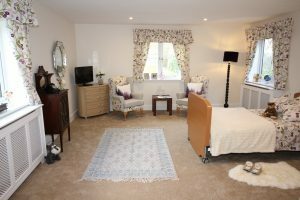 The rooms at Bramley House are decorated and furnished to a high standard but residents are encouraged to make the room their own. They are welcome to bring their own furniture, pictures, and other possessions. The rooms are light and airy with lovely views of the surrounding area. En-suite rooms with wet room showers are available. We want residents to feel comfortable and at home so if there is anything we can do to the room to help with this then residents only have to ask and we will see what we can do. Well behaved pets are also welcome (conditions apply).